Anna Mcdougal of Wiscasset at the State House in Augusta speaking out against the state's proposed rule change to assess eligibility for services for intellectually disabled adults. The Maine Department Of Health And Human Services wants to replace its current team approach for determining an individual's eligibility for some programs with a single test known as a Supports Intensity Scale, or SIS. Critics say IT fails to provide a complete picture of an individual's needs. 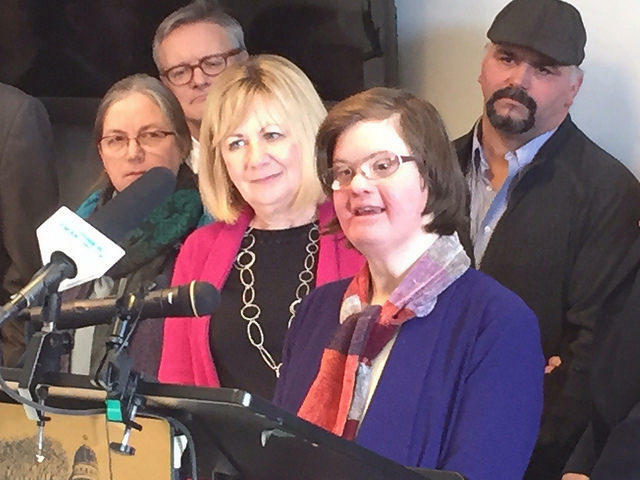 Debbie Dionne of Georgetown says her daughter, Kate, has been able to build a life for herself in a day program with the help of state-covered services that are assessed through a team that includes family members and health care providers. But she among those who fear that the change to a singular test will adversely impact the level of care for Kate, who is non-verbal, and has cerebral palsy and osteoporosis. "If the rates change and a reduced level of staffing is put into play, Kate will get far less support and her safety will become severely compromised," Dionne says. "I see the potential for a life-threatening situation that could result in a hospitalization or permanent injury for my daughter and for many others who will also lose those crucial supports in staffing." During an afternoon press conference at the State House, Dionne and others gathered to express their frustration with the proposed rule change that was the subject of a morning hearing at DHHS. The families of adults with developmental disabilities — and some of the adults themselves — say the new proposed SIS rules amount to a single high stakes eligibility test for those with intellectual disabilities or autism. Under the SIS, every adult with disabilities will be assigned a number between one and five that corresponds to caps on services and funding. Anna Mcdougal, of Wiscasset, says the SIS test is impersonal. "People with disabilities are not a SIS number — we've been labeled all of our lives," Mcdougal said. "We are not a score or a number — we have a voice. We have feelings. We are people and individuals." Other opponents say the new rule would directly effect more than 5,000 individuals in the state. David Cowing, of Woolwich, says many adults with intellectual disabilities who have already taken the SIS tests as part of a pilot program were less than satisfied with the results. "Many people are not pleased with the results of that assessment, they don't feel that it was an accurate measurement at the time that it was given," Cowing said. "I think it's hard to minimize the amount of stress and worry that families have when their services are questionable." "It's certainly not unusual for there to be a resistance to any type of change," said Mary Mayhew. "We need to make sure that the change that's being proposed here remains consistent with our principals." At DHHS headquarters, Commissioner Mary Mayhew says she understands why parents might be alarmed by the prospect of a new evaluation system for services. But she says the proposed rule change will actually result in more benefits for those who require them, and will allow the state system to address individual needs in a more targeted way. "The purpose of this rule is to increase the role of the individual receiving the services, to participate in determining what their needs are, what their goals are — and to create flexibility for them about the kinds of services and support that they can pick from in order to best reflect their individualized needs," Mayhew said. The proposed rule change is subject to final approval by the Maine Legislature.